I'd thought I'd choose a different topic to what I usually write about. My son is now a year old, 13 months to be exact - sometimes it is hard to believe it - so I thought I would give a retrospective on my transition into fatherhood. The tl;dr version: being a parent is hard! No, I mean really, really hard! Last May 2011 my wife announced to me at an unfavourable hour that her waters had broken. After calling the midwife we were told to make our way to the hospital in order for my wife to be induced; apparently her waters were greeny-brown, an indication that our son may have passed his very first stool before being born. Because midwives get concerned that this may cause stress to the baby, they wanted to induce my wife to get things going. For about 8 hours my wife was pretty much left alone hooked up to a monitor to check the baby's vital signs, with very little sleep for both of us (a sign of things to come. More on that later...) Only till the next shift did a couple of midwives come and attend to us, and attend to us they did: my wife then had round the clock care which was really good for her as she was getting upset at the lack of information given to us. Perhaps you've seen how babies are born on medical shows? It takes a lot longer than that. From about 8am till 1pm my wife was fed some sort of hormone drip which was meant to kickstart labour. The midwives were very good to my wife, always chatting and taking her mind off things. Once I came back from lunch did I really start to see the affects, as my wife's contractions had started. This was the bit where I came into the picture. Everyone knows from TV and films that the father is meant to stand next to his partner and encourage this very slow breathing technique through your mouth whilst your partner is screaming in agony telling you what you can do with that idea. My wife did not shout at me directly but was clearly feeling the pain. We had planned lots of things during the birth, built into a sort of "birthplan". Here's what new parents learn very quickly: plans of any kind go right out the window. My wife had intended to be in a birthing pool to help with pain relief, but to be induced means constantly being hooked up to drips and monitors. Walking and different positions also became difficult since her mobility was restricted from all these machines. Gas and air helped but there came a point - which originally she said she would refuse - to get the big gun out: the epidural. After waiting for an anesthetist (resulting in more screaming from my wife) one finally came. She was obliged to give my wife the legal stuff, such as side effects, consent etc, though my wife was sucking on the gas and air constantly and shouting "Yes! Anything!" at that point. It did help with the pain though, the only drawback being she couldn't even stand up anymore: the epidural is injected towards the base of the spine so it basically knocks out anything from the waist down. We had a bit of a breather for an hour or two at that point, which gave the midwives a chance to discuss with the next shift what has been happening (this would be about 17 hours since we arrived at the hospital). Finally, the big moment had come: it was time to get this baby out. The next bit has been censored. If my wife saw that I described the birth of our child in any detail whatsoever she would kill me! ...4 and a half hours later, our son entered the world! Now usually this is greeted by the baby taking their first gasp of air and crying, at least that is what I considered to be the norm. 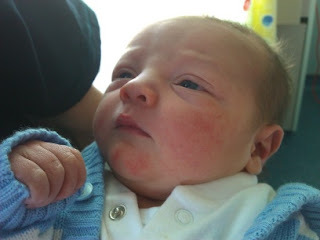 Not so my boy; he decided to basically keep quiet, thereby raising alarms and calling in what looked like every midwife, nurse and doctor on the maternity ward to see to him and get him breathing. Let's just say it was the most frightening experience of my life. But there was nothing to worry about in the end, he was breathing just fine and simply didn't want to make a fuss. Cheeky monkey. He was cleaned up and handed to my wife, who was still completely off her head from all the gas and air she was basically breathing in like oxygen. But it was there, that special moment when you realise that you have a little person that you instantly love. I stayed for another hour or two and then drove home to try and get some sleep while my wife still had work to do giving him his first feed.